The thermoelectric cooling is no mere gimmick. It really works. HP’s Omen Mindframe arrives as the war for your ears is heating up—or maybe cooling down. I never would’ve pegged “sweaty ears” as the next battleground for gaming headsets, but it’s the one more and more companies are choosing. Last month we looked at Razer’s Nari Ultimate, which (among other features) packed cooling gel into the earcups. Now HP’s Omen Mindframe arrives with an even more high-tech solution: Active cooling, to keep your lobes frosty for hours at a time. No, seriously. This review is part of our roundup of best gaming headsets. Go there for details on competing products and how we tested them. First let’s talk design, though. This is the first HPgaming headset we're reviewing, which is always interesting—especially when it comes from a brand, like HP, that isn’t traditionally associated with gaming. That’s starting to change, and indeed you’ll notice the Mindframe is classified under HP’s gaming-centric Omen sub-brand. Omen’s made inroads recently, in part because of some daring designs like the diamond-shaped Omen X and the monolithic Omen Obelisk. Those are HP’s most successful attempts in my eyes, recognizable as gaming PCs but looking more like slick science-fiction tech—or maybe retro-futurist tech, something out of 2001: A Space Odyssey or Star Wars. The Mindframe straddles the same line. It’s definitely a gaming headset, make no mistake. HP hits a lot of the usual markers, with a floating headband design and obvious LED lighting. You’re probably not wearing the Mindframe in an office, and you’re definitely not wearing it outside. It’s beautiful, though, and that’s not a word I use to describe headsets often. There’s an elegance to the way the headband “splits” and then reforms around the diamond-shaped earcups, a flowing shape that begs the eye to follow. The black-on-black logo speaks to HP’s confidence—the Omen line’s diamond motif unique and recognizable enough that there’s no need for more prominent branding. I do have a few minor complaints. The matte-black headband is quick to pick up fingerprints, which can be frustrating. Mindframe’s also made almost entirely of plastic, including the headband. That’s a bit worrisome for long-term durability, and the headset sometimes creaks ominously when I pull it on. Speaking of which, Mindframe’s weirdly small. I don’t have the largest head in the world, but I noticed the suspension headband is pushed all the way to its limits when I don the headset. Extra-large domes, beware. It’s comfortable though, especially after a few days of breaking in the headband. The Mindframe felt tight right out of the box, but it’s loosened up a bit and I can now wear it all day, no problem. Here’s how it works, as simple as I can make it: The Mindframe’s earcups each include a thermoelectric cooler, or TEC. A TEC consists of two layers, and when an electric current is run through both it causes a heat disparity, with excess heat then flowing from one side to the other. This is known as the Peltier effect. Mindframe uses the Peltier effect to keep the inside of each earcup cold. Like, really cold. Note that I don’t mean the padding, which is what Razer and others are keeping temporarily colder by adding cooling gel. The Mindframe keeps the actual headset cold, the metal grille that covers the driver. When you put it on, it feels a bit like a refrigerator door’s been left open—but only near your ears. And unlike cooling gel, which warms up over time, Mindframe stays cold as long as you have it powered. Six or eight hours in, the headset’s just as effective as when you first put it on. The TEC absorbs any ambient heat generated by your ears and expels it, leaving the interior generally a bit cooler than room temperature. In other words, Mindframe works as advertised. It keeps your ears cool, long past the point where most headsets become uncomfortable and swampy. The effect is subtle, but it works. There’s an unsettling side effect though, at least in my opinion. All that drawn-in heat has to go somewhere. In this case it gets dumped in heatsinks and then radiated out through Mindframe’s chassis. The inside is cool, but the outside of the headset feels strangely warm to the touch, like a charging phone. The Mindframe’s box includes a note about how to properly wipe away condensation build-up on the inside. Harmless but kind of gross. It’s not dangerous, but I definitely haven’t gotten used to picking up Mindframe and having it feel warmer than the ambient room temperature. And I should also note that condensation occasionally builds up inside the earcups, a result of the cooled metal grille. That’s also slightly weird. But hey, it works. That’s the important part. If you’re concerned about warm ears, especially during the hot summer months, Mindframe combats the problem in the smartest and most high-tech way I’ve seen. If only it sounded better. This is Mindframe’s big letdown. It’s a beautiful headset, with a gimmick that actually works—but audio playback is just average. Everything I pipe through it sounds a bit thinner than in other headsets, like the center channel’s been hollowed out. Bass presence is solid, the trebles sound crisp and clear, but it still sounds off, or like the sound is a bit distant. I think what’s happening here is that HP leaves 7.1 surround on by default, with no way to disable it. In fact there’s no means to change Mindframe’s sound at all, or not officially anyway. HP’s Omen Command Center only has two sections as I write this: Lighting and Cooling. The first lets you change the color of the LEDs, the latter lets you turn the cooling effect up or down. There’s no EQ, nor any way to turn off the faux-7.1 effect. That may explain why Mindframe performs a bit better in games, where that hollowed center channel is less noticeable—and why I notice it sounds strange in music, where I think the 7.1 is screwing with the standard stereo mix. I hope Omen Command Center gets a bit more robust in future updates. After all, HP's still early in its headset foray, and while the lack of an EQ and other basic controls is an odd oversight, it at least seems like an easy fix. If that happens, I’ll give Mindframe another listen. As it stands, though, the audio quality doesn't befit a headset with a whopping $200 price tag. Of course, much of that price is a result of the active cooling gimmick—but you should rightly expect audio fidelity equal to that of its peers. Mindframe is a wired headset, meaning it costs more than twice the price of some great-sounding competition, and $50 more than our favorite wireless sets, too. That’s a high price to pay for cold ears. Lastly, some notes about the microphone. It’s a standard boom-arm design, folding down from the left earcup as you’d expect and then flipping back up to mute. The end is flexible rubber, but it’s a bit stiff and thus difficult to position perfectly. Performance is solid for general voice chat. My only real complaint is that it interrupts playback to beep in your ear every time you flip it up or down. Wholly unnecessary. The headset space is exciting these days. The more crowded it gets, the more gimmicks we’re seeing. It’s one of the few reliable ways to stand out, especially if, like HP, you’re coming late to the market. The more gimmicks you put out there, the more likely it is one will stick. HP’s thermoelectric cooling is one that deserves to stick around. Not only does FrostCap work as advertised, it seems like a net improvement for the HP Omen Mindframe’s overall comfort. That said, the tech’s expensive: $200 for a wired headset is a lot these days, and HP shows its inexperience in the field by making a few rookie mistakes—the beeping microphone, the lack of EQ and 7.1 control. I hope some of the more egregious issues can be solved in software, because Mindframe is so close to being a great headset, price be damned. We’ll be keeping an eye on it. Note: An earlier version of this article said this was HP's first gaming headset. Oops! It's not, but it is the first one we've reviewed. Adjusted accordingly. 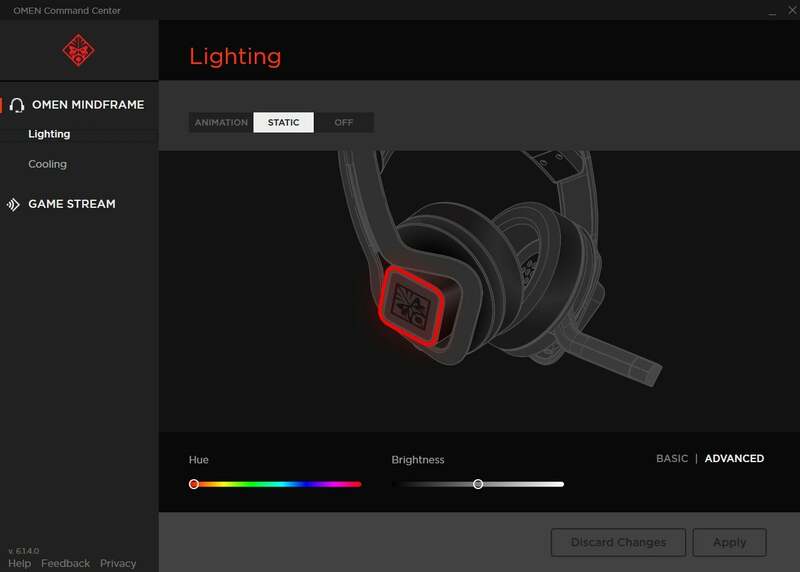 This story, "Omen Mindframe headset review: HP nails the cooling, but the basics need work" was originally published by PCWorld. The HP Omen Mindframe comes close to being a great headset with an interesting gimmick, but some beginner mistakes—lack of EQ or 7.1 controls, a beeping microphone—and oddities like its warm chassis keep it from stardom. For now, at least. No official EQ capabilities or 7.1 controls. Software is oddly bare-bones.